The room at Brothl. All photos by Pavia Rosati. Editor's update: This restaurant was amazing, but Brothl has sadly closed. We're not taking the story down, because it remains an amazing place fueled by an even better idea. Melbourne, Australia, usually ranks at the top of the list for happiest, most livable cities on earth. Fathom's Pavia Rosati went for the first time this summer, and fell in love. 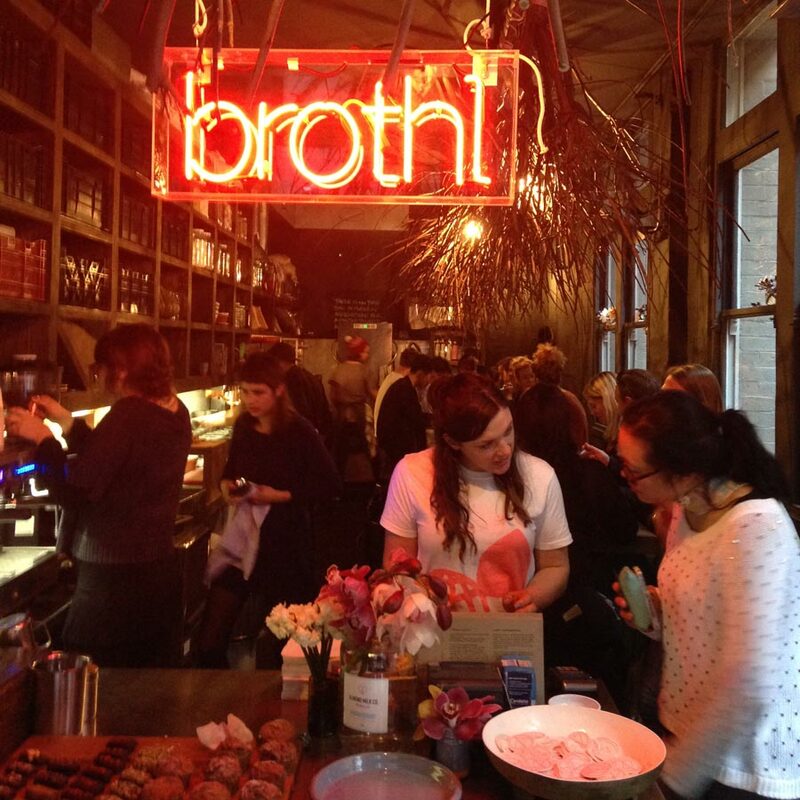 One new restaurant, Brothl, held particular appeal, and not only because it was at the forefront of the new bone broth trend. MELBOURNE – Brothl is not about hookers, though I'm sure we're expected to suppose that it is. 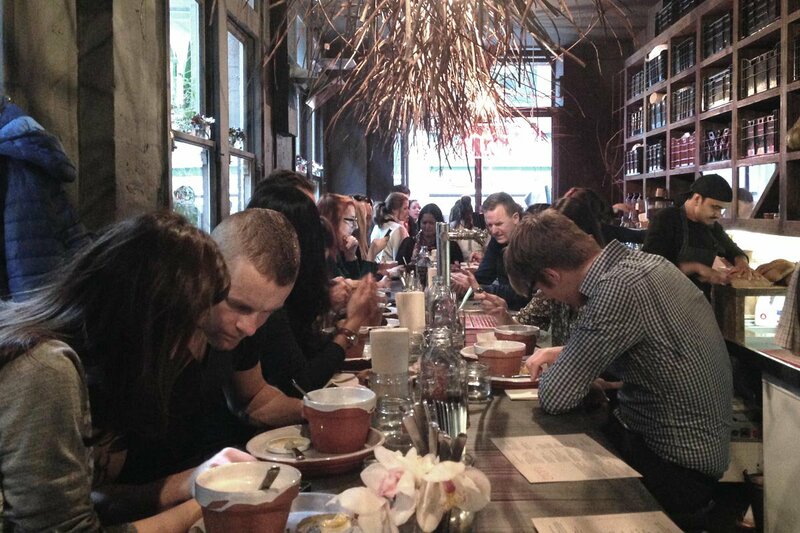 It's about broth and bones, and meals served at a long communal table. The dropped vowel is partly modern cheek and partly symbolic of the zero-waste philosophy that inspired Joost Bakker, the creative mind behind the new Melbourne eatery where I had an unforgettable lunch. Unforgettable not in the four-hour-food-extravaganza way, but rather in the think-about-how-and-what-you-eat way. At risk of sounding all woo-woo, Brothl is fast food conceived and served with integrity, consciousness, eco awareness, and charm. (The charm is what makes the whole thing irresistible.) Woo-woo seems integral to the Brothl DNA: "Imagine a world without waste..." is the opening salvo on their website. Joost, a fifth-generation tulip farmer, is not a traditional restaurateur. He's a maker — of greenhouses, vertical gardens, housewares, and sustainable commercial and residential buldings. The setup at Brothl is simple: You walk in, wait for a seat at the long table that runs the length of the narrow space, and order from the menu printed on the place mat. Start with a base broth — oats, beef, chicken, fish, vegetable — then add extras — brisket, soba, foraged kelp, day-old bread, mushrooms. 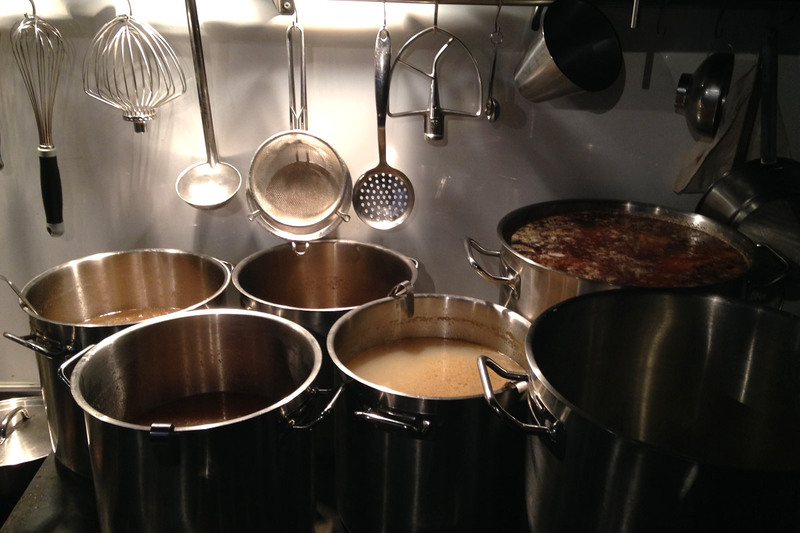 I love a good soup, I love to tinker with a recipe, I love a kitchen that is happy to cook what I want. The broth is made from upcycled bones sourced from the kitchens of Melbourne's best restaurants, like Attica, Rockpool, and the European. Bones, in other words, that might otherwise get trashed. (Also from the website: "40-50% of what is considered organic waste in Australia can be and should be consumed as nutrient-rich food.") Hence the zero waste idea: The bones get a second life here, simmering in giant pots in the open kitchen along the perimeter of the room. A room which barely even has a perimeter. "Compact" doesn't begin to describe this place. I was given a single seat at the head of the table at the end of the room, which gave me a commanding view of the whole scene. The couple to my left were having a passionate debate about failed college romance, and it was all I could do not to scream, "dear girl, you have to dump this putz!" The gang to my right were discussing a video they were directing that weekend in Fitzroy. The elbow-to-elbow vibe made for a more intimate experience, as if all these cool Aussies sitting around the table were already my friends. And, really, is there a more intimate, soul-pleasing food than soup? 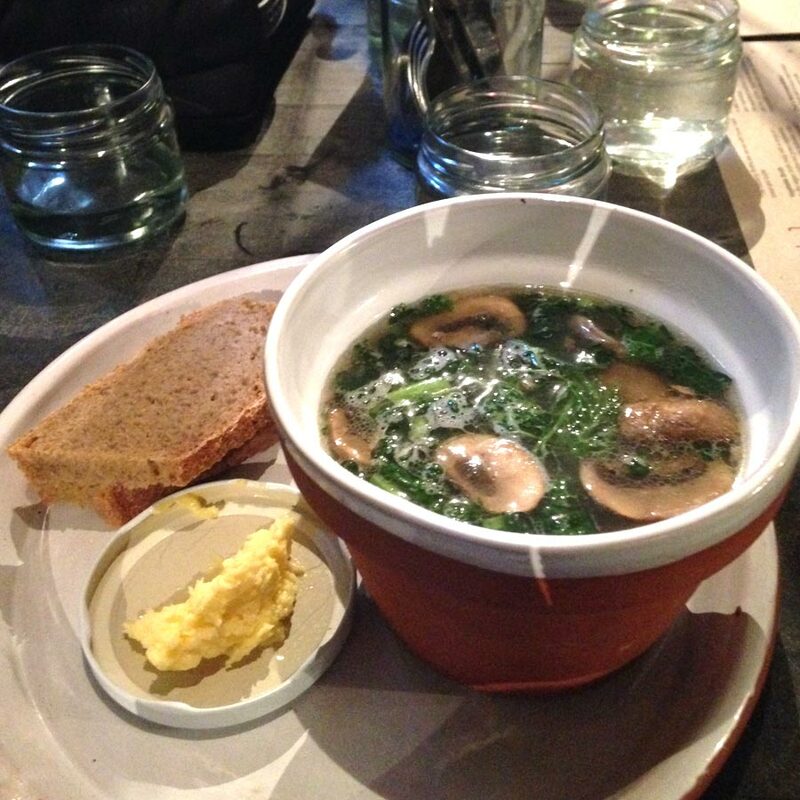 My soup was served in a glazed flowerpot (a Joost design) with a slice of hearty bread and a knob of butter too big for one person to finish. The soup was as rich and delicious as I had hoped, layered with flavors and so clearly full of health-giving enzymes and nutrients. Oh, and I ate every bit of that butter. From my home town of New York City to Melbourne would be a long commute for a bowl of soup, but it's enough to inspire a return trip. Open Monday - Saturday, 10 a.m.-10 p.m. Walk-ins only; no reservations. A shorter version of this article was written for The Guardian.